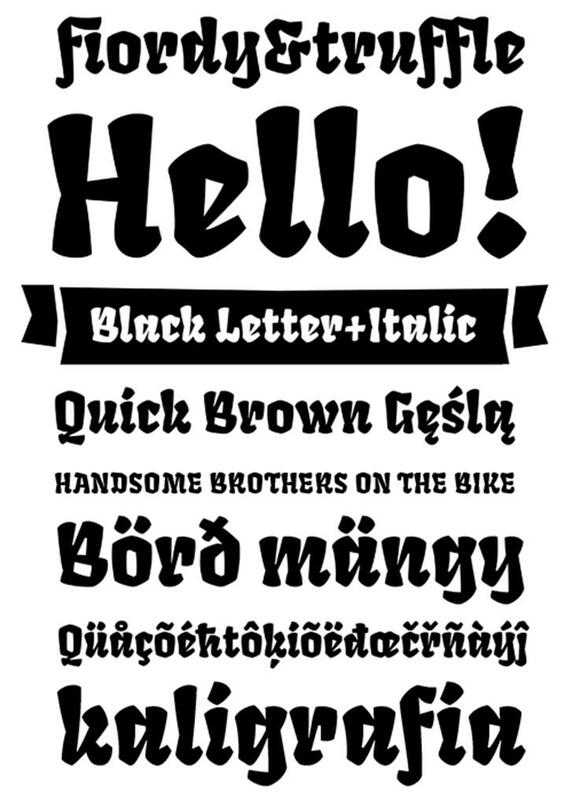 Fruktur initially appears to be a playful and powerful black letter type with a warm friendly feeling. However its construction is closer to that of an upright italic. Fruktur offers some of the feeling of a black letter but with higher legibility and greater utility than is typical of black letter type. Fruktur will be most useful from medium to large sizes. Fruktur appears to be a playful and powerful black letter type at Fruktur initially appears to be a playful and powerful black letter type with a warm friendly feeling. However its construction is closer to that of an upright italic. Fruktur offers some of the feeling of a black letter but with higher legibility and greater utility than is typical of black letter type. Fruktur will be most useful from medium to large sizes. Fruktur is a trademark of Sorkin Type Co.